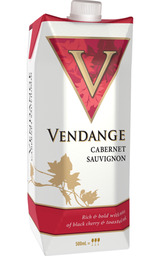 Deep garnet red with a hint of purple in color, this Merlot is plush with highlights of spice and red berry aromas. Sweeping, full flavors of ripe raspberries and plums are tinged with subtle toasty oak nuances that add to the smooth and inviting finish. Pairing Ideas: Beef Chili with Kidney Beans, Noodles with Poppy Seeds, Walnuts and Roquefort.